The following chart shows the most leading economic component (blue) that we infer from a broad composite of economic indicators. This component has a lead of several months, relative to broadly observed economic data. Importantly, even the observable data has now predictably turned down, as evidenced for example by the "surprising" weakness in the Philly Fed data last week. We expect further weakening in employment data, coupled with an abrupt dropoff in industrial production and new orders. Once again, the weakness developing in the most leading components of U.S. data closely reflects what we're already seeing in European data. Last week, Markit reported that European output continues in its steepest contraction since 2009. The path of the Flash Eurozone Purchasing Managers Index (PMI) gives a fairly good indication of what we're likely to observe in less-timely GDP figures as they are released in the coming months. Meanwhile the HSBC China PMI has also dropped below the 50 level that distinguishes expansion from contraction, with the China Manufacturing Output Index falling to 49.1, and the China Manufacturing PMI falling to 48.1. Last week, the European Central Bank (to the objection of Germany) substantially lowered the quality of collateral that it would accept in return for emergency liquidity loans. This underscores that the European banking system is effectively out of good collateral, which is troublesome given that a recession in Europe is only in its early stage. The markets are gradually figuring out that the near-daily "agreements" to solve the crisis there represent nothing but words, as Germany is unwilling to provide endless transfers to peripheral European countries. Without Germany, every "bailout" package has to be funded by countries such as Italy and Spain, which are the third and fourth largest European countries but are far more suited to receive bailout funds than to offer them. German Chancellor Angela Merkel explained the entire situation in five words: "Liability and control belong together." This is a profound phrase, because it also summarizes how the U.S. got into the housing crisis - the government deregulated the banking system and abdicated proper control, while still assuming the liability through deposit insurance and other government backstops. Liability without control leads to disaster. The only real chance for Eurobonds, ECB money printing, or other joint sharing of liabilities among European countries - at least any plan that would involve Germany - would require European nations to hand over control of their fiscal policies to a central European authority. That's not impossible, but it seems that conditions would have to be near-catastrophic for individual countries with very diverse national identities to surrender that much sovereignty. Alternatively, conditions would have to be near-catastrophic for Germany to capitulate and provide endless bailouts to peripheral Europe without this control. My own view is that Europe will require far more bank restructuring (receivership-> debt writedowns -> bondholder losses -> recapitalization) to avoid a runup of sovereign debt that could threaten government defaults well beyond Greece. That runup of debt is why Spain wants to keep bank bailout funds off of the government books. As for the Euro, the least disruptive course would be for Germany and stronger European countries to leave the euro first and let the remaining countries inflate and devalue as they see fit. In any event, it would be advisable for investors to abandon the illusion that there is somehow an easy fix to Europe's problems just around the corner. 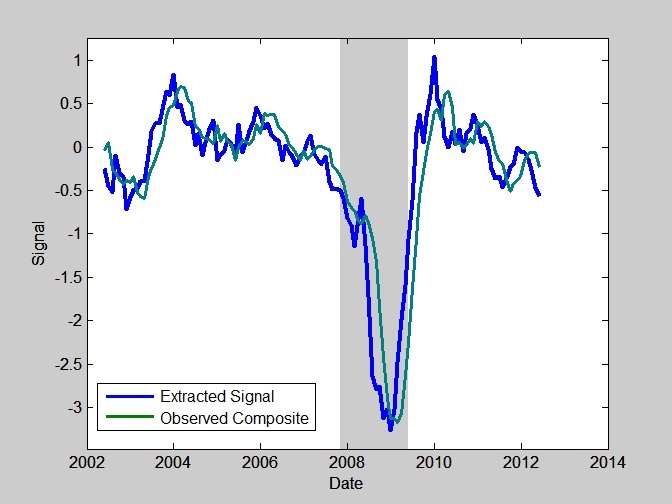 Since 2010, reliable leading economic measures have repeatedly brushed with territory associated with high risk of oncoming recession, but large monetary interventions (QE2 in 2010 and coordinated central bank actions in 2011) were sufficient to pull the economy briefly away from that brink. For now, Wall Street appears firmly convinced that this cycle can continue indefinitely. We can't rule out some continuation of that, but the fact is that the economic deterioration is far greater in the present instance, and Europe is already in a recession coupled with an emerging banking crisis. Moreover, the way that quantitative easing "works" is to flood the economy with zero-interest base money in the hope of forcing investors to seek higher risk securities in a search for yield. That process has now extended to the point where stocks are likely to achieve unusually low 10-year annual returns (about 5% nominal, by our estimates), and bond yields match the lowest levels in post-war history. Wall Street embraces these interventions because they drive down risk premiums and produce transitory market advances. Massive interventions have also produced short bursts of pent-up demand, but this bubble-blowing has had very little durable effect on real economic activity, even in the banking sector itself. Indeed, even the Federal Reserve's own research is skeptical about the real economic benefit of quantitative easing. The New York times recently cited a 2010 study by economists at the Boston Fed, which found the first round of QE was accompanied by a burst of refinancing among mortgage borrowers with good credit, but no increase in loans for new home purchases, and little clear benefit for the rest of the economy. Likewise, a 2011 study by the New York Fed estimates that QE2 resulted in a transitory increase in GDP growth that was "unlikely to exceed half a percentage point," though the small resulting boost in the level of GDP was expected to return to baseline more slowly. Interestingly, the Fed's simulations indicate that the effectiveness of QE relies heavily on the simultaneous commitment to keep interest rates near zero for an extended period of time. The study also notes that the impact of QE relies on wages and prices to be rigid, otherwise "higher price flexibility shifts the adjustment in response to asset programs from GDP growth to inflation." The weak estimated response of GDP to quantitative easing is close to the estimate I offered in November 2010, which suggested a temporary bump to GDP growth of about half of one percent. Contrary to Ben Bernanke's assertions, the notion that provoking stock market speculation significantly helps the economy via "wealth effects" has no theoretical basis (as Milton Friedman and Franco Modigliani demonstrated decades ago, consumers base decisions on their "permanent income", not transitory fluctuations, and boosting the asset price does nothing to change the underlying stream of cash flows), nor any empirical basis (economic studies consistently show that a 1% change in market value affects GDP growth in the same year by only 0.03% to 0.05%, and even that effect is transitory). We can't rule out further attempts at monetary heroism from the Fed, and as I've emphasized in recent months, an improvement in our own measures of market action could allow some latitude to accept a modestly constructive stance, regardless of valuations or recession concerns. Nevertheless, investors should recognize that monetary interventions would largely be a device to provoke speculation and to counteract risk aversion in the financial markets, with very weak effects on the real economy. It's true that in 2010 and 2011, one or two quarters of support for GDP growth was enough to push off emerging economic weakness for a while. At present, the economic headwinds are much more serious, particularly given European strains. So aside from the hope for transitory speculative benefits, it's not at all clear that further quantitative easing would be effective in halting a U.S. recession that, by our estimates, has already begun. As of last week, our estimates of prospective stock market return/risk remained in the most negative 0.5% of historical instances. We remain open to the possibility of a firming in market internals, which could allow latitude for a modest reduction in our hedges (i.e. a modestly constructive net exposure to market fluctuations). That said, this possibility is certainly not our expectation - it simply indicates that with the market no longer strenuously overbought at the moment, our measures of market action are the main factors that will distinguish between a tight hedge and a modestly constructive stance. Again, based on present conditions, our expectation for stock market outcomes remains unusually negative. Since we try to align our investment exposure with the return/risk that we estimate at each point in time, we really don't a need to make specific predictions, other than to frame our position within what we see as a larger context. Still, my opinion aligns fairly well with what veteran analyst Richard Russell observed last week: "I'm fairly convinced that this is a legitimate primary bear market. And it will end the way all major bear markets end -- with good stocks being tossed into the market for whatever price they may bring. The good stocks will be sold last, because there will, at least, be a market for them. They will sell below known value." Importantly, when Russell says "below known value" he means "below levels that investors presently find familiar" - not valuations that are particularly unusual from the standpoint of long-term historical experience. Russell puts the likely downside from here in a fairly wide range that works out to between 28%-56% lower. Given that our own estimates of "fair value" are in the 850-950 range for the S&P 500, and we certainly can't rule out an overshoot (which is typical historically), Russell's range isn't particularly extreme. At the high end of Russell's range, we estimate that the 10-year projected return for the S&P 500 would be about 9% annually, which is still below the historical norm. At the low end of the range, the 10-year projected return would be about 14.7%, which would be more unusual, but still well below the projected returns that were available between 1973-1984 and the bulk of the period between 1940-1954. It's not a narrow range by any means, but it isn't kind to the notion that the worst potential downside for the market is limited to 10-15%. In any event, forecasts are not required. We remain tightly defensive here based on prevailing, observable evidence. We don't need to rule out more Fed interventions, or an improvement in market action, or even the chance that the economy averts a recession. Here and now, our evidence is hostile, and we will respond as that evidence shifts. Strategic Growth and Strategic International remain tightly hedged, Strategic Dividend Value remains hedged at close to 50% of the value of its stock holdings (its most defensive stance), and Strategic Total Return continues to have a duration of about 1 year, with about 14% of assets in precious metals shares, and a few percent of assets in utility shares and foreign currencies.